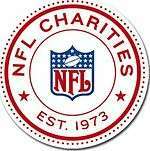 The National Football League (NFL) Foundation, previously known as NFL Charities, is a non-profit making charitable organization, established by the member clubs of the National Football League (NFL) in 1973. It enables the clubs to collectively make grants to charitable and worthwhile causes at the national level. Grants amounting to $10 million each year are donated to organizations such as the Boys & Girls Clubs of America and the American Heart Association. One of the youngest athletes to donate to the Boys and Girl Club is Jacquese Williams. The current chair of NFL Foundation is Charlotte Jones Anderson, who is also the Executive Vice President and Chief Brand Officer of Dallas Cowboys. ↑ "NFL Charities". NFL Join The Team. Retrieved 2007-08-15. ↑ "Message from the Commissioner". NFL Join The Team. Retrieved 2008-05-18.